Procurement rules are part of the routes. Go to the Inventory application, Configuration ‣ Settings and tick Advance routing of products using rules. 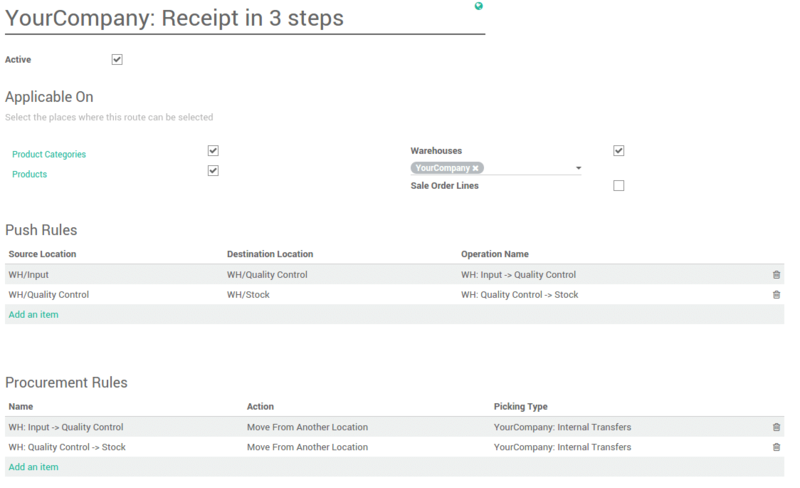 Odoo has some pre-configured routes for your warehouses. In the Inventory application, go to Configuration ‣ Warehouses. In the Warehouse Configuration tab, Incoming Shipments and Outgoing Shippings options set some routes according to your choices. In the Inventory application, go to Configuration ‣ Routes. First, you have to select the places where this route can be selected. You can combine several choices. If you tick Warehouses, you have to choose on which warehouse it will be applied. The route will be set for all transfer in that warehouse that would meet the conditions of the procurement and push rules. If you tick Products, you have to manually set on which product it will be applied. If you tick Product Categories, you have to manually set on which categories it will be applied. If you tick Sales order lines, you have to manually set the route every time you make a sale order. In order to make it work, you also have to activate the use of the routes on the sales order. In the Sales application, go to Configuration ‣ Settings and tick Choose specific routes on sales order lines (advanced). What is a procurement rule? What is a push rule? If you work with no stock, or with minimum stock rules, it is better to use the Make To Order route. Combine it with the route Buy or Manufacture and it will trigger automatically the purchase order or the Manufacturing Order when your products are out-of-stock. How to do inter-warehouses transfers? How to organize a cross-dock in your warehouse?